Social media has changed the reasons we connect to the Internet, but next-generation mobile devices like Apple’s iPhone and Google’s Droid are changing how – and where – we can go online in ways that would have been unimaginable just a few years ago. Having a mobile version of your company’s website is no longer optional. At Medora, we can help you develop a business mobile website that loads and displays correctly across every type of mobile device, and carries as much impact as your regular home page would. We can also develop a full-featured mobile applications better integrated with device hardware and software. Mobile web design might be a relatively new art, but that doesn’t mean your mobile site shouldn’t be up to the highest standards. 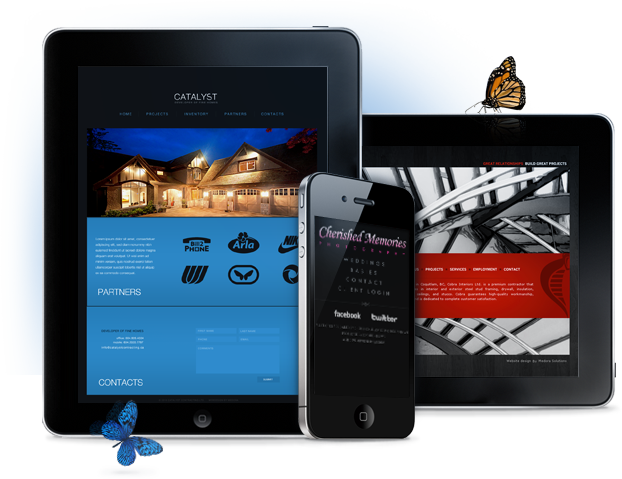 Mobile business websites for the whole world to see. Whether your customers are coming to you via iPhones, Droids, or other next-generation mobile devices, we’ll design a site that loads quickly and correctly every time. Mobile web design isn’t just about making things smaller; it’s also about making them more adaptable. Every Medora website can be viewed horizontally or vertically, and we design without Adobe Flash, which doesn’t load correctly on mobile devices. Same ideas, brand new interface. Because mobile web users interact with your site differently – using features like numbers for clicks – you need a mobile web design partner who knows how to take ideas that work and transfer them to this new format. We’ve got you covered. We utilize fast-loading layouts and graphics with low ﬁle sizes, meaning that your mobile business website will open up more quickly, without causing your customers to incur heavy bandwidth charges.